There are several peculiar things connected with the Presidential elections in Azerbaijan on 9 October, but surely the one that is most peculiar is that two leading contenders are not campaigning at all. One does not want to, and the other cannot. The announcement by the Executive Secretary of the governing New Azerbaijan Party (YAP), Ali Akhmedov, that President Ilham Aliev will not be campaigning did not come as a surprise. Ahmedov told journalists that the incumbent President Ilham Aliyev’s election campaign is based on his achievements as president. “So, actually there is no need for the President to personally participate in the election campaign. Changes are not expected in the president’s schedule in connection with the elections. As regards the election campaign, many members of the New Azerbaijan Party will campaign on his behalf with great pleasure. President Ilham Aliyev’s election campaign will be held in an atmosphere of high activeness. The support of the absolute majority of the people and deep trust in Mr. Ilham Aliyev will remain as his most important advantage of the election campaign,” he said. President Aliev has been spending most of his time in the run up to the campaign visiting the regions of Azerbaijan and opening new projects and buildings. There have been no references at all in his speeches, either to the election and less so to the opposition parties and candidates. A second candidate is also not campaigning. 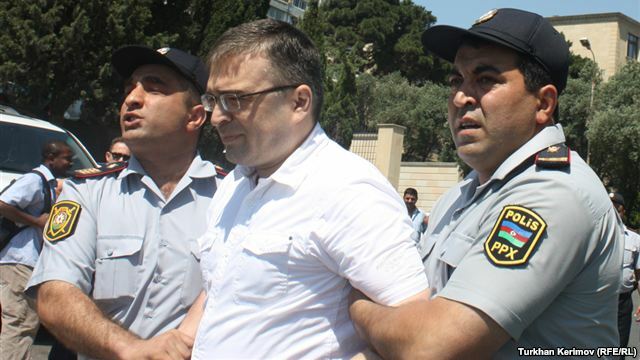 Ilgar Mammedov, the chairman of the REAL movement is in jail awaiting trial on charges of inciting violence. The charge is connected with incidents in the region of Ismaili last January. Mammedov’s campaign is being organised by colleagues in the REAL Movement. It is not clear if he will be allowed to use television air time. Calls by REAL for Mammedov to be released in order to participate in the election campaign have so far not been heeded. The absence of two key contestants from the campaign, as well as the last minute uncertainty regarding the candidate of the other main opposition candidate representing the National Council, has resulted in overall general apathy amongst the electorate and visitors to Baku have remarked about the complete lack of election atmosphere. Georgia: On the right course, but a free electoral environment is a must.